While most counties in Texas merely had a jail, Collin County had a prison, if only in name. One half block off McKinney's Square, this simple, utilitarian fortress was the work of F.E. Ruffini and finished in 1880. 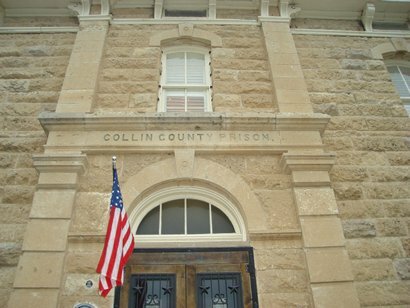 Written in stone above the door are the words: COLLIN COUNTY PRISON. Until recently that was the only door in or out. Presently undergoing restoration, it wasn't long ago that this building was on the Historic Commission's Endangered Buildings List. While new breath is being breathed into the structure, this is the address where E. Stepp breathed his last. Convicted of killing a man and sinking the corpse in a well, Mr. Stepp was the last legal execution in Collin County before the State assumed the task. The fatal day was November 17, 1922, and having no permanent gallows, an impromptu affair was set up with a plank running through two windows of an upper corner. "Mr. Ed" was the executioner du jour. A detailed and entertaining transcribed oral history by the former jailer is available in the McKinney Public Library. Claude West was the jailer, and the son of a Collin County Sheriff. For many years a jailer's job was seven days a week - 24 hours a day. Mrs. West cooked for family and inmates alike, although Mr. West got more syrup on his hotcakes. Claude wore a medium brim Stetson hat, carried a long barreled .38 and was proud of the fact he wore dress shoes instead of boots. Another personality was "Uncle Bud", who would arrive unannounced and park his "coach" in the alley. He was sent to transport those prisoners who had graduated to Huntsville. Huntsville was and continues to be the only town offering "bus service" to all 254 Texas counties. A considerate man, Uncle Bud would wait while prisoners sent a messenger to their families, so they could be properly sent off. (This also gave him time to enjoy Mrs. West's cooking and a visit with Claude). Charles "Tex" Watson of the Manson Group (not an investment firm) also spent time here awaiting extradition to California for his part in the Tate-LaBianca killings. Charles went to High School in nearby Farmersville.